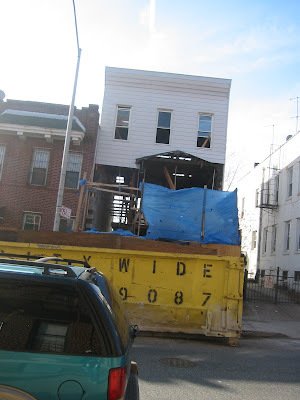 Apparently, 'tis the season for gutting houses. The 50's are seeing loads of activity right now, but this house is following the example of the 43rd Street house one block away. It seems a little upside down to me (I'd feel safer starting at the top), but I know nothing about construction. It's always a little disconcerting to look through a building, isn't it? There are several supports holding up the third level; I hope everyone has his hardhat on! ps: The tilted aspect is my poor photography skill, not the actual building.